LEGO bricks were one of the original toys inducted into the National Toy Hall of Fame in 1998, along with Crayola crayons, marbles, the Frisbee, and Barbie. Since 1958, they have all been made to interconnect, so a vintage 1958 LEGO brick will connect perfectly with a brand new kit off the shelves of a modern toy store, according to the company. According to curator Liz Miller, Sawaya was a “big time” attorney in Manhattan who would come home and build with LEGO bricks to escape the pressures and frustrations of his day job. Eventually, Sawaya started wondering whether he could incorporate LEGO bricks into fine art. “He took a giant leap of faith and left his law career behind to dedicate himself to becoming a LEGO artist,” Miller said. Sawaya is considered to be the first artist to use LEGOs as a medium. According to Miller, many of his works reflect Sawaya’s experience of leaving his career to follow his dreams. “A lot of the works you see on our main floor galleries have titles like ‘Pushing Against,’ ‘Trapped,’ or ‘The Artwork Inside,’ and they’re all of these really cool human figures in these emotive forms,” Miller said. “The poster boy for the exhibit is ‘Yellow’ – he’s a yellow sculpture who is opening his chest and bricks are pouring out.” According to Miller, many of the sculptures evoke thoughts of people pushing their limits, much the way Sawaya pushed the limits of how LEGO bricks were used. In that part of the exhibit, Sawaya teamed up with famous photographer Dean West to create composite photographs that combine real locations and people with LEGO brick sculptures. Part of the fun of that exhibit, according to Miller, is trying to find the LEGO parts of each image. Miller pointed out that Sawaya hopes people will be inspired by his work. 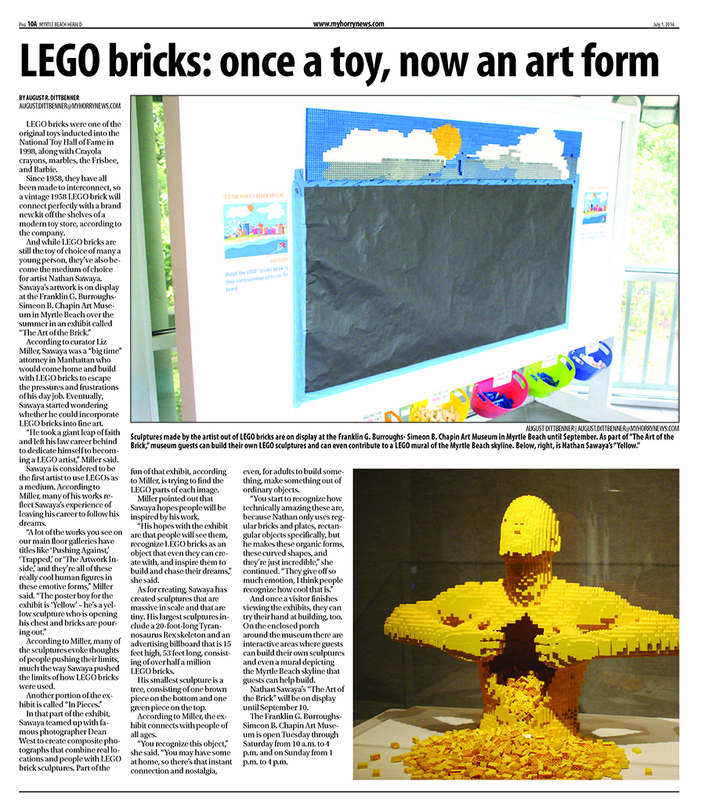 “His hopes with the exhibit are that people will see them, recognize LEGO bricks as an object that even they can create with, and inspire them to build and chase their dreams,” she said. As for creating, Sawaya has created sculptures that are massive in scale and that are tiny. His largest sculptures include a 20-foot-long Tyrannosaurus Rex skeleton and an advertising billboard that is 15 feet high, 53 feet long, consisting of over half a million LEGO bricks. His smallest sculpture is a tree, consisting of one brown piece on the bottom and one green piece on the top. According to Miller, the the exhibit connects with people of all ages. “You recognize this object,” she said. “You may have some at home, so there’s that instant connection and nostalgia, even, for adults to build something, make something out of ordinary objects. “You start to recognize how technically amazing these are, because Nathan only uses regular bricks and plates, rectangular objects specifically, but he makes these organic forms, these curved shapes, and they’re just incredible,” she continued. “They give off so much emotion, I think people recognize how cool that is.” And once a visitor finishes viewing the exhibits, they can try their hand at building, too. On the enclosed porch around the museum there are interactive areas where guests can build their own sculptures and even a mural depicting the Myrtle Beach skyline that guests can help build. Nathan Sawaya’s “The Art of the Brick” will be on display until September 10. The Franklin G. Burroughs- Simeon B. Chapin Art Museum is open Tuesday through Saturday from 10 a.m. to 4 p.m. and on Sunday from 1 p.m. to 4 p.m.